I wonder how many of us can remember that we once had an annual event called "Sing Singapore", and another "Swing Singapore". To those whe think ZoukOut is the only great outdoor, it only happened long after Swing Singapore decided to go into hiatus. Swing Singapore was a big thing then where the whole of Orchard Road was closed and turned into a party ground. Sing Singapore was an annual festival of songs when many beautiful songs that we are familiar were written during that period. Maybe it is because the event coincided with National Day festivities, the songs took on the identity of being National Day songs rather than Singapore songs. The music essentially were catchy, more towards folksy and the lyrics were pictorials of the Singapore life. Today, you may want to categorize them as evergreens. 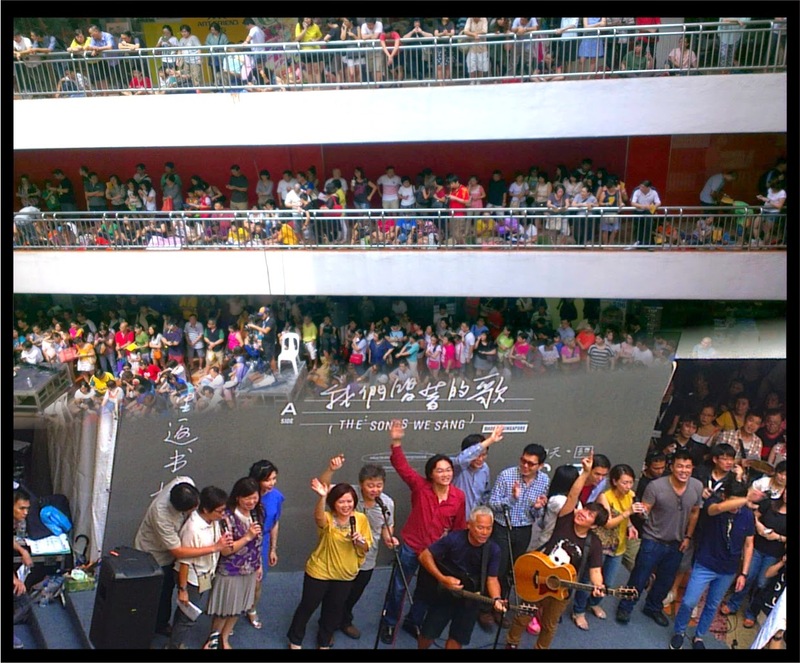 Just yesterday afternoon, 6th of July 2014 at the Bras Basah Complex, Singaporeans gathered to pay tribute and celebrate a very special era in Singapore's history of music and entertainment, the Xinyao 新遥 movement. Xinyao 新遥 translates as Singapore Songs or Songs of Singapore. The.Xinyao 新遥 movement had its heydays in the 1980s. It was at a time when Singapore's Chinese music scene was highly influenced by Taiwanese Mandopop, and the Hong Kong Cantopop, and Xinyao 新遥 was able to permeate society on equal footings with the two. Key figures of the movements were Liang Wern Fook 梁文福，Eric Moo 巫启贤, Li Feihui 黎沸挥, and many more seen in the picture above. They were young, energetic, and flushed with ambitions. Each went on to succeed in their respective music career during a period when the music industry is flourishing, particularly in Taiwan. With each going their way, a vacuum emerged in Singapore. However the Xinyao 新遥 movement is extremely resilient and able to survive the perils of oblivion and this is because it is not a passing fad but a unique culture in the lives of Singaporeans. Despite parting ways, pursuit of career and the separation of time and distance, each of these pioneers of the movement; a unique generation at that era never at any one time forgot where they started, what held them together, and where they had wanted to go. And it was this unbreakable bond that brought them together again and again. To the audience, Xinyao 新遥 was what they grew up with, and inseparable part of their lives. Notably Cai Yiren of 弹唱人 had helped keep the spirit of Xinyao active in recent years through his annual concerts 重逢. It was really at yesterday afternoon's celebration at Bras Basah that we saw the Xinyao 新遥 spirit truly resurrected to its original beauty, casual and unfettered. At the celebration, performers and audience were gelled together not just by music and songs alone; but also by lots of fond memories and endearment; and also a strong common belonging between them. That's the reason why I call it a celebration and not a concert. 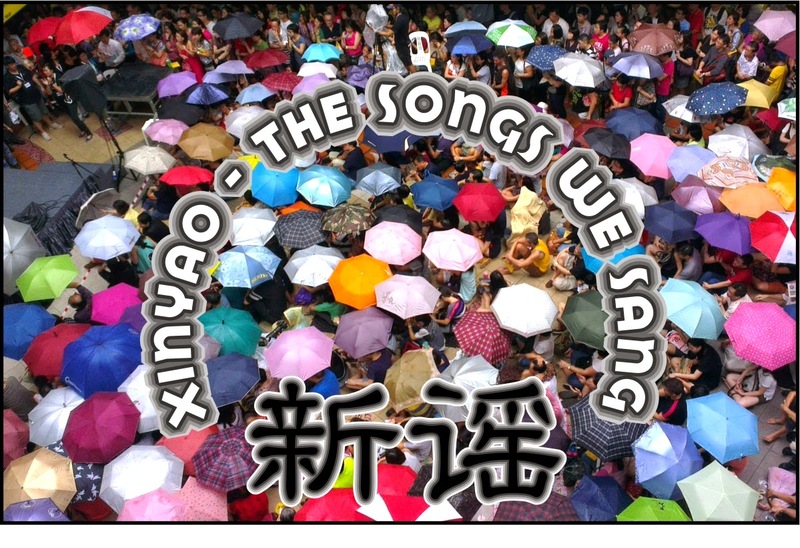 The theme title and the venue was so aptly chosen, that by no mistake these were "The Songs We Sang" and symbolically of ordinary Singapore folks, in the concourse of Bras Basah Complex. May I wish Xinyao 新遥 as a movement, as a culture to fully blossom, and take this part of the Singapore Identity to a new generation of singers and song writers, creating new hopes and aspirations for all. Best wishes to one and all in the Xinyao 新遥 movement.